The heritage-listed Tara House is being sold to pay debts as the Queensland Irish Association winds up. 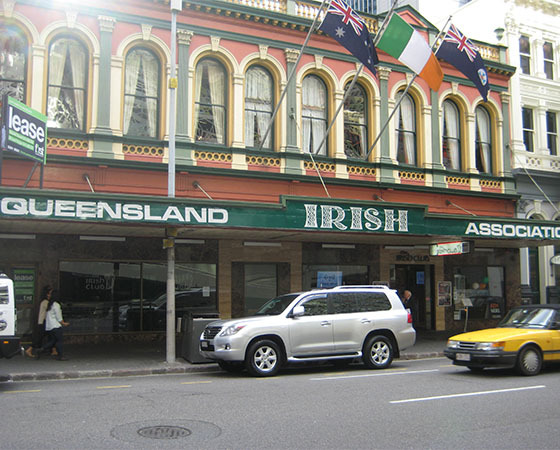 After going into administration in January, followed by liquidation in April, the Irish Club in Brisbane has been listed with a major commercial real-estate firm. Given recent property sales in Queensland’s capital, such as buildings in Albert St and Margaret St which went for $36m and $30m respectively to Singaporean interests, there is every possibility Tara House could also be bought by foreign investors. The Irish Club had debts of more than $3 million when it went into liquidation. David Clout and Associates handled both the administration and liquidation. In a letter to creditors, Mr Clout said a settlement of claims has been postponed “until such time sufficient funds are realised to make a distribution. “Creditors will be notified in due course with the relevant notices and dates on when a distribution will be made,” the letter said. The heritage-listed building in Brisbane’s CBD has been announced to the market through an expressions of interest campaign. This is the first time the 2,200 square metre property has been offered for sale in its 95-year history. “The site has the potential to be used for a multitude of options, including hotel, residential, student accommodation and office,” the Knight Frank prospectus says. The sale is expected to attract strong interest because of the building’s unique character and potential. The property is being offered either as a straight sale of the heritage freehold investment or a potential subdivision investment sale to incorporate the Queensland Irish Association. A source familiar with the situation told the Irish Echo that for many the latter option is preferable. “There is a lot of work going on behind the scenes to ensure the association remains alive in the future,” the source said. “The premises has a fair bit of value to it. I’m quietly confident that something positive will come out of this. The building incorporates classic detailing and architecture. “This is a great opportunity for an astute investor to purchase a unique heritage building in a sought-after CBD location,” Knight Frank commercial sales executive Tom O’Driscoll said. The most recent heritage building sale in Queensland was the Brisbane Polo Club building, which sold for $10 million to a Singaporean investor. Mr O’Driscoll said this and other recent high figure sales “highlight the level of interest from offshore investors, and we anticipate local investors to show great interest as well, particularly given that it is a well-known site in a tightly-held location”. With Brisbane property prices considerably lower than those in Sydney and Melbourne, the CBD investment market is very active at the moment, with many developers looking for student accommodation and residential apartment opportunities. The expression of interest stage for the sale of the Irish Club will run for several weeks, with all offers to be reviewed and considered by the end of July, Mr Clout said.